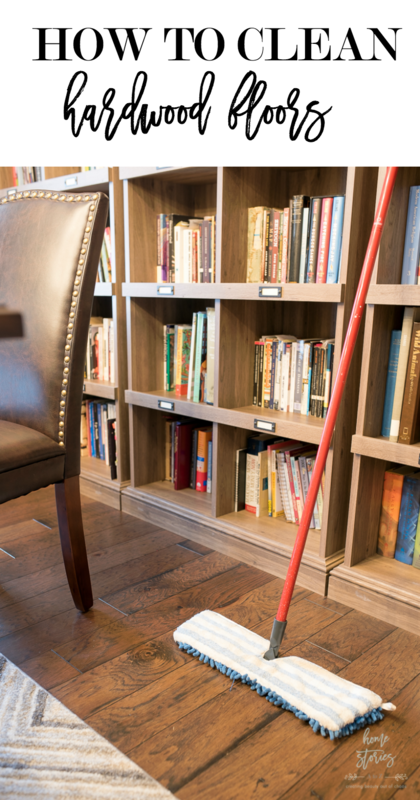 Properly cleaning and maintaining your hardwood flooring will protect them for years to come! 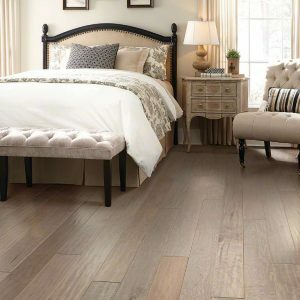 Read on for tips from the experts at Shaw Floors on how to clean and maintain your hardwood floors. This post is sponsored by Shaw Floors. All opinions are my own. One of the first improvements I made to our new home was the flooring! The wall to wall carpet in all of the bedrooms had seen better days and needed replacing. 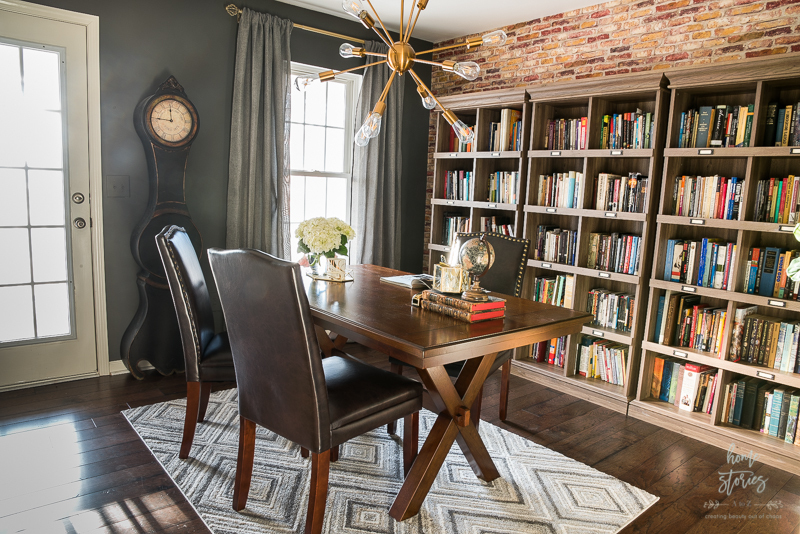 Although I don’t mind the coziness of carpet, I prefer the look and feel of hardwoods. We have two very furry Pomeranians and their fur is often difficult to remove from carpeting and rugs. Between the kids and the dogs, I find hardwoods so much easier to keep clean! 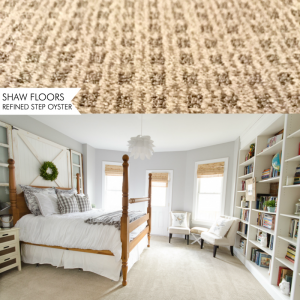 This past fall, I replaced all of our carpeted rooms with Shaw Floors Epic Plus engineered hardwoods. 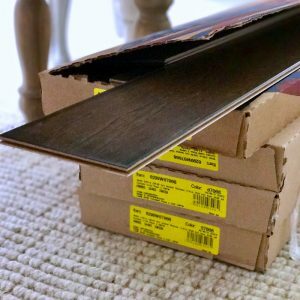 You can see more of our hardwood installation experience in my post, Flooring Installation: What to Expect. After installing our floors, many of you asked how I keep our hardwoods so clean. It got me thinking that I might not be cleaning them properly, and I should really check with the experts to find out how it should be done! 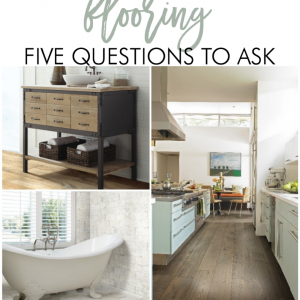 Flooring is a sizable investment and it makes sense to know how to properly protect your investment from the onset. I asked my friends at Shaw and am excited to share with you what I learned! 1. 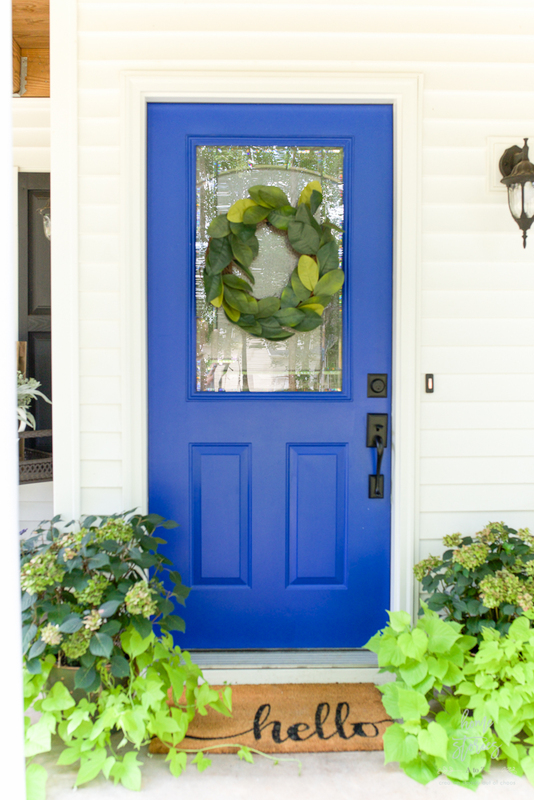 Trap the elements before they enter the home. Placing entry mats on the exterior and interior of each point of entry of your home will help collect the dirt, sand, grit, grease, and other unwelcome substances that might otherwise be tracked onto your hardwood flooring. Also consider having a “shoes off inside” policy to keep dirt from being tracked in. 2. Use breathable rugs on wood floors. Rubber or foam backed plastic mats may discolor the flooring finish. Instead, use an approved vinyl rug underlayment beneath your rugs in order to prevent slippage. 3. Use floor protectors and furniture pads underneath furniture. Heavy furniture can indent and scratch the surface of your hardwood floors. As a rule, the heavier the object, the wider the floor protector needed. Furniture pads on the feet of furniture work well underneath smaller pieces. 4. Control your home’s humidity to minimize the natural expansion and contraction of the wood. If you live in an extremely dry area or have a wood stove, you may need to use a humidifier to prevent your floors from excessively shrinking due to low humidity. Likewise, if you live in a climate with excessive humidity it is advisable to use an air conditioner, dehumidifier, or heater to help maintain ideal humidity levels. 5. Keep sharp things off of your floors. Granted, this tip sounds like a no brainer at first glance; however, some sharp things you might not think about include stiletto heels, cleats, spiked golf shoes, and even pets’ nails. Trim your pet’s nails to prevent them from scratching your floor and slip on spiked shoes outside. 6. Protect your floors when moving furniture or heavy objects. It may be tempting to roll out your refrigerator to clean behind it, or slide a heavy armoire to a different part of the room, but doing so without proper floor protection risks indenting or scratching your floors. Use a protective mat or quarter inch plywood to protect your flooring. Butcher paper is unfortunately not sufficient. 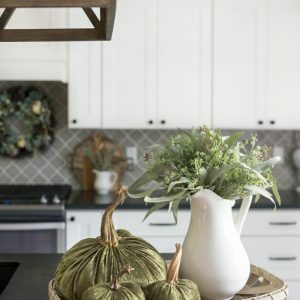 Now that we’ve covered how to cut down on dirt and grime entering the home let’s dive into how to clean the floors once they are dirty! 1. Sweep, dust, dry mop and/or vacuum the floor regularly. 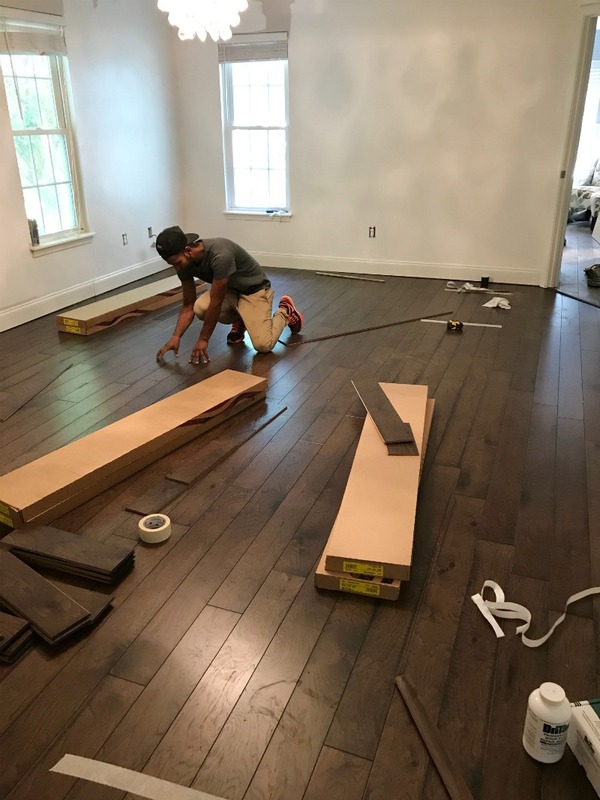 Dirt and grit can scratch and dull your hardwood flooring finish. Prevent accumulation by staying on top dirt. I use our Roomba daily which helps immensely cut down on dust, dog fur, and debris. I also use a dust mop for quick touch ups. When vacuuming your floors, it’s a good idea to turn off the beater bar which can damage floors. 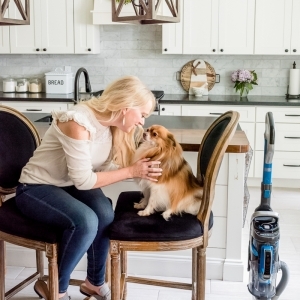 If you live in a sandy area (or out in the country where kids and dogs are constantly in and out), you may need to dry mop and vacuum more frequently. 2. Do not wet mop your floors. 3. Wipe up spills immediately. Okay, in all fairness I don’t know one woman who would just leave a liquid spill on her wood floors until later, but if you are the one this tip is for you. Never allow liquids to stand on your floor. Use a damp cloth to immediately wipe up any spills. 4. Use 10% acetone for tough spots and oil-based stains. If you happen to spill oil, paint, markers, lipstick, ink, or tar on your hardwoods then try using 10% acetone/nail polish remover on a clean white cloth to remove the stain. I prefer to scrape paint off using a flat scraper. 5. For spots such as candle wax or chewing gum, harden the spot with ice and then gently scrape with a plastic scraper, such as a credit card. Be careful not to scratch the flooring surface with your scraper. Once you’ve removed the debris, wipe the floor clean with a damp cloth. 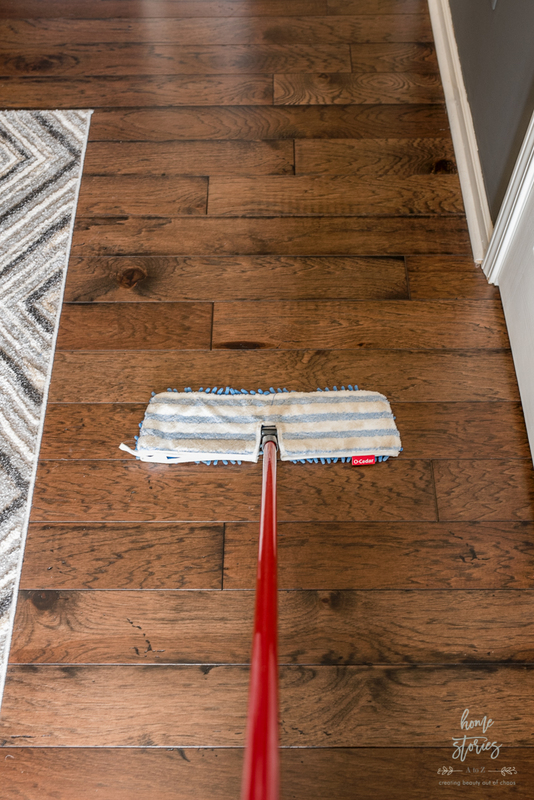 I hope this post helps you clean and maintain your hardwoods! Let me know if you have any floor cleaning questions, and I’ll do my best to get you answers. You might also like my related posts below!